The Legendary Hyperborea and the Ancient Greeks: Who Really Discovered America? In his story of Atlantis, written at around 360 BC, Plato mentioned a grand island or continent across the Atlantic, one larger than Libya and Asia combined. 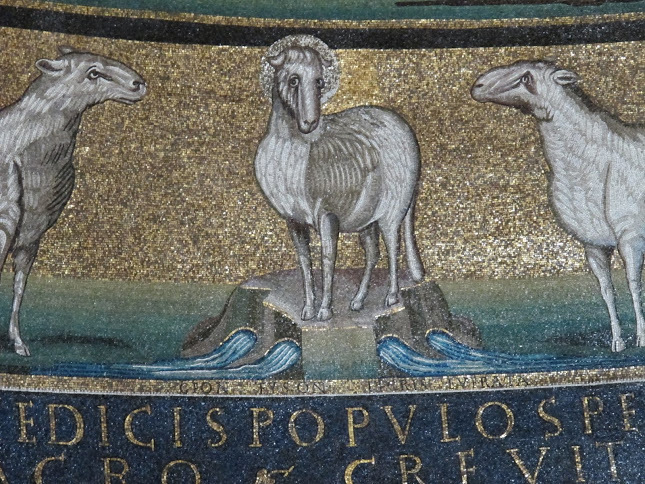 This continent was so enormous, he said, “it encompassed (wrapped around) that veritable ocean”. Is it possible that Plato was talking about the American continent and not that of Atlantis, as many automatically assume when they read that story for the first time? Let's not ignore that many scholars and researchers also show that proper translation of Plato's text places Atlantis in the Mediterranean and not in the Atlantic, or some other exotic location. Aside from those claims though, is it conceivable to accept that the ancient Greeks, around the 4th century BC, knew of the American continent across the Atlantic? Interestingly, several clues suggest that this may not be such an outlandish assumption after all. Roughly twenty years ago, in 1996, Mark McMenamin, a professor of geology at Mount Holyoke College in the United States, discovered and interpreted a series of enigmatic markings on the reverse side of a Carthaginian gold coin, minted circa 350 BC, as an ancient map of the world. In the center of this world map there is a clear depiction of the Mediterranean basin. An image to the right of it is interpreted to represent Asia, while the image to the left is interpreted to represent the American continent. Professor McMenamin also found that all known specimens of this type of coin formed the same type of “world” map. This was an interesting discovery, no doubt; however, what is most interesting about this find, is that this particular Carthaginian coin was minted within the same decade when Plato unveiled the story of Atlantis and revealed that there was a large continent across from the Pillars of Hercules. The Piri Reis world map, named after its maker, a Turkish admiral and renowned cartographer (1465-1553), drawn in 1513, merely two decades after the ‘discovery’ of America by Christopher Columbus, depicts the west coast of Africa, Europe, as well as the entire American continent on the Atlantic side. According to Piri Reis, however, his controversial map was based on several other charts, many dating as early as the 4th century BC! While by any means the famous map does not come close to a satellite image, it still properly depicts the continents on both sides of the Atlantic, although with one major flaw. It shows the horn of South America turning sharply eastwards, almost at a 90-degree angle, as if South America "wraps around" the Atlantic at the bottom of the map. Of course, some go on to speculate that the horizontal body of that land could be that of Antarctica, thus the controversy, since Antarctica was not discovered until 300 years later. 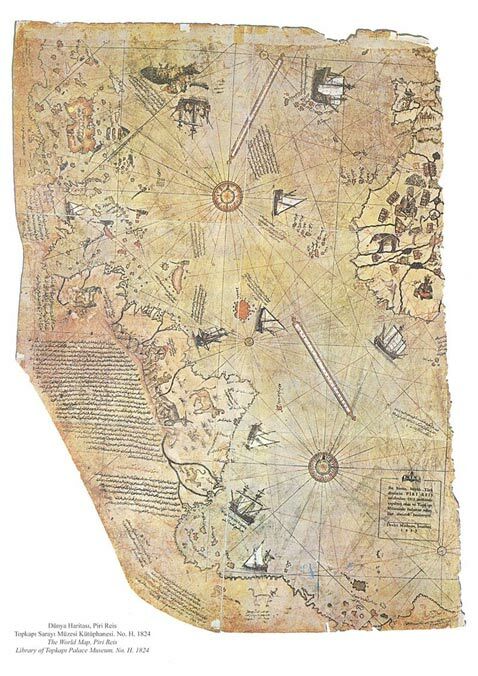 Although the controversy in Piri Reis' map significantly diminishes without Antarctica in it, the existence of this map still helps reinforce a couple of assumptions made earlier. If truly Piri Reis borrowed from other ancient maps dating back to the 4th century BC, then unquestionably this reinforces the suggestion that Plato, at 360 BC, could have been aware of the American continent in order to include it in his story. Moreover, is it possible that the apparent flaw on Piri Reis' map, which most likely also appeared on the much older originals, explains why Plato was under the false impression that the immense continent across from the Pillars of Hercules “encompassed” (wrapped around) the Atlantic Ocean. Just as in the northern hemisphere, where North America, along with Greenland, Iceland and few other islands seem to encompass the North Atlantic. Is this possible? While undoubtedly skeptics would dismiss this suggestion, interestingly, the Greeks believed that Hyperborea was an unspoiled territory so far north from Greece, the sun there never sets. Of course, the only place due north where the sun continuously shines, at least six months out of a year, is the region above the Arctic circle, a territory obviously not easily accessible, especially during the winter months. ‘Coincidentally’, the poet Pindar (522 BC – 443 BC) wrote that “neither by ship nor on foot would you find the marvelous road to the assembly of the Hyperboreans,” a statement that further corroborates the inaccessibility of this region. So, when bearing in mind this place's location (somewhere “extremely north”,) the fact that is somewhere where the sun never sets, and this is a region inaccessible by foot or boat (most likely due to a frozen Arctic Ocean), where else can a place like this be? Can Hyperborea have been the figment of vivid imagination, or is it possible that there was some truth to this story, as in the case of other stories brought to us from ancient Greece, which involved real places wrapped in mythical elements? Such, among others, was the Palace of Knossos, which it was associated with the Minotaur (a mythical beast of half man and half bull,) the city of Troy which was connected with an epic war fought by demigods, and Mount Olympus, which was thought to be occupied by gods. What about Hyperborea though? Is it possible that the Greeks managed to navigate so far north, or was that knowledge passed down to them from others, such as the Minoans perhaps? If, according to historians, the Bronze Age Minoans 4,000 years ago were often traveling as far as Scotland and the Orkney Islands to trade goods, is it inconceivable to assume that over time (going back and forth for a thousand years) they may have eventually reached Greenland (the edge of Hyperborea,) only a couple of short island stops away? And, if those ancient navigators managed to reach Greenland via island hopping, is it possible then to assume that they could have gone a bit further and ultimately reached North America, which in essence, is just around the corner? If not, where did thousands of tons of copper from the region around the Great Lakes disappear to during the Bronze Age? Most importantly, how did spices, plants and insects indigenous only to America find themselves in Santorini (a Minoan island) around the period of 1600 BC? An excavation in the ancient city of Akrotiri, on the island of Santorini, revealed that a tobacco beetle (Lasioderma serricorne), an insect indigenous to America at the time, was found buried under the volcanic ash of the 1600 BC eruption. If tobacco was not introduced to Europeans until around 1518 AD, as history claims (nearly 3,000 years later), how else did this pest of stored tobacco got there. Furthermore, how were the Egyptians able to obtain tobacco and other plants indigenous to America, like coca leaves, which were often used during mummification? Indeed, in 1992, German studies revealed that one third of all mummies tested, carried traces of nicotine on their hair, skin, and bones. Also, the same tobacco beetle found in Santorini was found inside the mummy of King Ramses II (1213 BC), as well as inside King Tutankhamen's tomb (1323 BC). If our early Mediterranean ancestors did not know of North America 10,000 to 12,000 years ago, how then did Haplogroup X, a Mediterranean gene, find itself in North America around that timeframe and as Plato claimed? For those not familiar with genetics, each race around the planet is categorized by scientists according to their particular DNA haplogroup. For example, all American Indians contain haplogroups A, B, C, and D. As haplogroups A, C, and D are also found primarily in Asia, and B mainly in China and Japan, it is highly speculated by anthropologists that these four haplogroups traveled to North America during a glacier period when continents were once connected by ice. A more recent study, though, on certain Native American tribes, especially those around the Great Lakes, revealed that in addition to the above haplogroups they were also found to carry haplogroup X. If Middle Easterners somehow made it to America 10,000 years ago, why do only tribes around the Great Lakes carry this particular gene? And, most importantly, how did Mediterranean people travel to North America? If this was some random transfer, as some scientists maintain (see Solutrean Hypothesis), why then did no other haplogroup from at least a dozen in Europe at the time not follow X, as the four Asian haplogroups on the opposite side of the map ultimately followed each other via the Bering Strait? Is it possible that haplogroup X navigated to North America in a contained environment as Plato claimed? 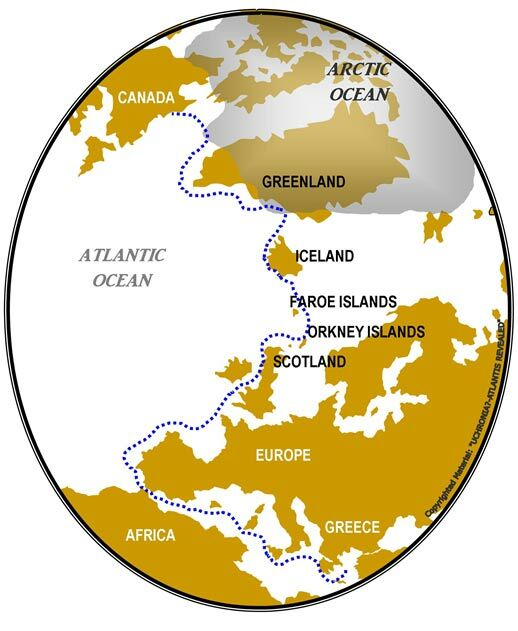 Or, is it possible, as the majority of anthropologists suggest, 10,000 years ago Mediterranean people walked to America while ice still connected the Asian and American continents at the Bering Strait? A huge problem with the scientific claim, though, is that en route from the Middle East to America, the furthest region east of the Mediterranean to carry small traces of haplogroup X is that of the Altai Republic in southern Russia. No traces of haplogroup X (a variation of X, or another European haplogroup) exist further east of that region. We must also not ignore that mtDNA maps show that the highest concentrations of haplogroup X exist on the Atlantic side, around the Great Lakes, and not in Alaska or alongside the west coast, where, according to anthropologists, haplogroup X infiltrated America. And last but not least, we must not ignore that high traces of haplogroup X strangely exist in Scotland, Orkney Islands, Faroe Islands and Iceland, essentially all the island stops from Europe to North America. Christos A. Djonis is author of the book “ Uchronia? Atlantis Revealed ”. Unless otherwise noted, images are the Copyrighted Material of Christos A. Djonis and have been used with permission. Christos A. Djonis, was born in 1961 on the Greek Island of Cyprus. 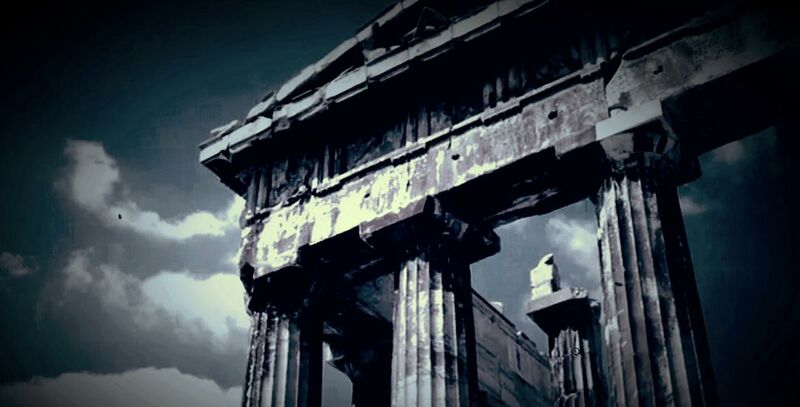 Before migrating to United States in 1981, he lived in Athens, Greece, where he also finished his studies. Check this. youtu.be/6Wbn_1oHWTc?t=1h42m44s It’s description of Shlaraffenland and painting of mountain that leads to that land, mountain in centre of Hyperborea. And here understandingrome.files.wordpress.com/2013/01/cd5.jpg we have painting from The Basilica of Saints Cosmas & Damian in Rome – understandingrome.wordpress.com/tag/saints-cosmas-and-damian/ . It’s very similliar mountain, with 4 rivers. I consider this more just coincidence. Plato may have lived and written in the 4th century BCE, but then again, he might just have come out of the imagination of Gemisto Pleton (same basic name) in the 15th century. The Greeks not only said Hyperborea had 24 hours of sunshine, they also said it had a wonderful warm climate. Modern geology shows it once had a tropical climate. If you would like to learn a lot about ancient maps such as the Mercator map pictured in this article, watch the great video called the Lazeria Map Collection on youtube. And if you like it, watch other Harry Hubbard videos on history and other interesting subjects. Who Discovered America? - Native Americans! Possibly Vikaria for the North but stick with the rogue Amerigo for America S !